The Louisville Arena Authority, and its sales representatives Team Services, LLC, didn't have to go far from home to land a naming partner for the city's new 721,000 square-foot arena. Yum! Brands, the Louisville-based QSR giant, has signed a $13.5 million, 10 year agreement to become the naming rights partner for Louisville's new downtown arena. KFC Yum! Center will be the new name for the venue opening this fall. The deal, which was negotiated with Team Services, LLC, includes a right of first negotiation to extend the agreement for five years beyond the 10 year agreement if both parties agree in the eighth year. "We are absolutely thrilled to unveil our new arena name, KFC Yum! Center," said Jim Host, Chair of the Louisville Arena Authority. "We have been patient throughout this process, knowing the excitement was building for this particular day when we could announce which company would capitalize on this marquee naming rights partnership. We are deeply appreciative of Team Services' efforts in culminating the naming rights transaction with Yum! Brands." Yum! Brands will also get exterior signage positions, including overlooking the Ohio River, as well as a position on the arena roof. "Yum! 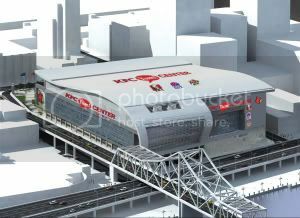 Brands is extremely proud that Louisville's newest and most spectacular venue will be named the KFC Yum! Center," said David Novak, Chairman and CEO, Yum! Brands, Inc. "As the world's largest restaurant company based in Louisville, with 1,400 local employees, we have always been committed to investing in our own hometown. Since 1997, when we became a public company, we have donated nearly $35 million to over 100 non-profit organizations, from the arts to education, to social service agencies such as Metro United Way, Juvenile Diabetes, Dare to Care Food Bank, The Muhammad Ali Center and many, many more. The KFC Yum! Center is another great way for us to give back to the community and make it a great place for our employees and their families," said Novak. KFC Yum! Center will feature seven different concession areas where KFC, Taco Bell and Pizza Hut products can be purchased. Which products are offered will depend on the event being held. Other benefits of the deal include a double center court suite, digital messaging rights, an interior signage package and premium hospitality options. "This is a tremendous day for our commonwealth and our city as we announce that Yum! Brands, a high-caliber, Kentucky-based company, is adding its name to our outstanding new Louisville landmark," said Mayor Abramson. "We could not be more proud of this partnership as the arena gets ready to open its doors in a few short months." In addition to collegiate athletics, the KFC Yum! Center will play host a variety of concerts and family events. "Our directive from the Arena Authority from the outset was to find the ideal partner for the arena name entitlement," said E.J. Narcise, Principal, Team Services, LLC. "Together with Yum! Brands we have crafted a 'partnership platform' that will allow the community to be the true benefactor of this relationship. The opportunity to bring together two of Louisville's iconic brands, U of L Basketball and YUM! is very special."